In August of 2010 Amina, Coolout Chris, and Ang13, three grassroots hip-hop artists from Chicago, were selected as United States Cultural Envoys by the U.S. Department of State. 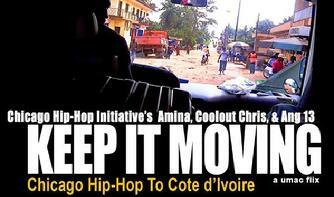 Representing the 'Chicago Hip-Hop Initiative' an artist collective, these artists visited 7 regions of the West African nation of Cote d'Ivoire (Ivory Coast) performing, conducting workshops, and initiating dialogue on the many ways hip-hop can promote and affect progressive social change. What follows is a cultural exchange, that changes everyone's life forever! The American's don't speak French. Most of the Ivorians they meet don't speak English, but fortunately for everyone they all speak HIP-HOP!